The Brighton School is a radical, new post-graduate art school for the benefit of Brighton itself. The idea is a simple one: to harness the talent and ideas of the best Brighton graduates each year, and put this talent to work on real projects across the city. At the same time, the school gives these graduates a means to stay in Brighton, and a paid route into the work they want to do. 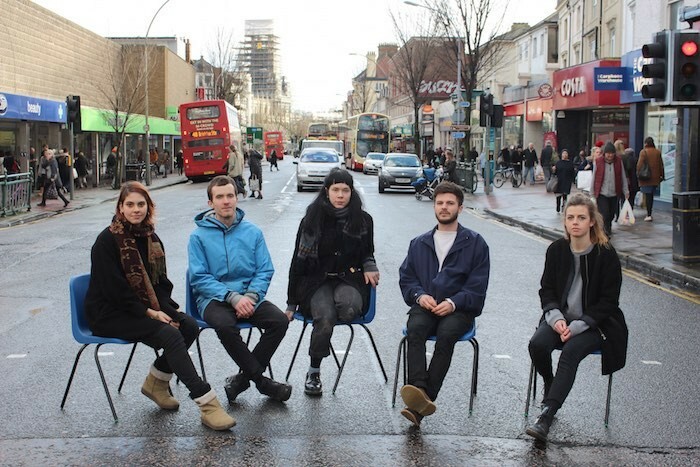 The project was put together to address two things: a lack of new, critical ideas in Brighton, and a lack of opportunities for talented graduates to have an impact on the city in which they studied. The aim from the start was to pay these graduates a wage for their work, and to challenge the model of free internships in London as the only way into creative careers. The first iteration of the school ran from January to July 2015. It was built around a public art brief for a busy Brighton high street, and comprised of five talented Brighton graduates. I led the programming of the school, recruiting Muf, Air and Kathrin Bohm as external tutors, and helping to shape the end product: a strange, subtle and beautiful work of art, in the form of the first and largest urban stone circle in England, and probably the world. The Brighton School is a Spacemakers project, directed by Matt Weston, programmed by yours truly, produced by Andy Felton. You can find more here. Graduates-sitting-in-the-road photo in homage to this, but with more traffic: do not attempt to recreate this photo at home, with your own post-graduate art school. Any videotapes sent to us will be returned to you, unopened.